Stroll along with us, and simply enjoy it for its floral beauty! Cedar spotted a sign for a Military Museum and we were able to accommodate. The CFB Esquimalt Naval and Military Museum focused on the contribution and life of the Navy and Army on the West Coast of Canada. While Cedar was off learning about the 100+ history of the Royal Canadian Navy Ships, I focused on the lifestyles of the officers and the Canadian Women's Army Corp. These hankies and postcards (below) were hand needle pointed by the European women in WWI. They were then sold to the soldiers as souvenir's. The stitchers would sell them to make a little extra money. Elegant, stately, historic, and memorable. Over many years we have heard about Afternoon Tea at the luxurious Fairmont Empress in Victoria, BC. We always imagined we would have that opportunity 'some day'. Some day finally arrived, and we had 3:00 reservations for tea. Afternoon Tea is served in the Lobby Lounge, and advance reservations are a must. This iconic location is considered a 'must do' while in Victoria. The Royal China Collection sets the scene for what is to come. The original china was first used at The Empress in 1939 when King George VI and Queen Elizabeth (the Queen Mother) made their voyage across Canada. They had this china pattern with service for 250 guests shipped to the hotel from England. Beginning in 1998, this pattern has been reproduced exclusively for use at The Empress. A tea cup and saucer came home as a souvenir of this extra special tea. Our tea orders were taken, and the waitress placed a tea sac filled with loose leaf tea into each pot, and then filled the pots with hot water from this beautiful urn. The pots were brought to our table with small timers to properly steep the tea. There are six tea selections that are included in the price of the tea, the Empress Blend or the Fairmont Breakfast were popular among our group. Peppermint herbal or traditional Earl Grey were also options. If you want to pay a little extra, there are an additional 15 tea flavors to choose, white monkey paw, a rooibos, organic oolong or keemun for example. This was definitely a very special once-in-a-lifetime event! We did not want to return home and regret not having attended this ultimate tea time experience. After we placed our tea orders, we ordered the Afternoon Tea for our group, with the exception of one. Our waitress had to request special permission for this lad's personal request. Hamburgers and fries in the Lobby Lounge, oh my! Each dessert was a work of art! Kudos to the pastry chef! Adding more hot water to the tea pots. An August birthday month celebration at its finest! Murchie's, a tea purveyor for over 120 years touts their expertise in the area of importing and blending tea which they have passed down for generations. Billed as 'a tradition of excellence since 1894' we definitely made this a 'must visit' destination! Conveniently, there was a great bookstore right next door, so everyone was happy! With such a variety of tea, both loose leaf and teabags, packaged in gift assortments, in boxes or tins, white, green, black, or specialty blends, it was impossible to select just one! And if that decision seemed impossible, the variety of china and various tea accoutrements were all silently beckoning 'take me home'. A simple purchase of Canadian Breakfast black tea was made. It seemed the perfect Canadian remembrance. It is a brisk full bodied blend of black teas that consists of a base of Ceylon and Keemun with a touch of maple flavoring that enhances the natural caramel and malty notes of the black teas. As flavored teas go, it is rather nice as the flavor is not predominant. Looking forward to enjoying this one on a crisp fall morning. 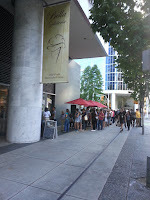 Our ice cream fan found the First Place North American Champion Gelato while on vacation. 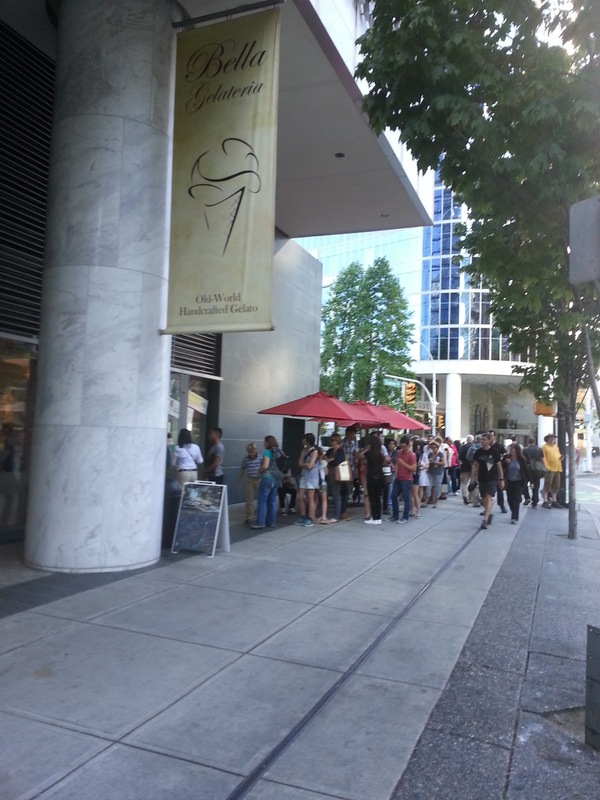 Dedicated to quality gelato, we waited in quite the line. The gelato is made on sight and served in colorful dishes or decoratively hand packed on a cone. They had traditional flavors in addition to lavender or earl grey, even matcha. We discovered we're a pretty traditional family when it comes to selecting flavors! What better way to see the Temperate Rain Forest then on horse back? Vacations are for everyone and that includes our horse girl. Billed as a true West Coast experience, we did a hilly trek through some local parks, up and down a mountainside. This shared space welcomed dirt bikes, hikers, runners, bird watchers, dog walkers, girl scout troops and horse riders. It was a well utilized space. It was full of cool, mossy, ferny, old growth woods. After our trail ride. We had reservations for tea at the elegant Empress, Fortunately, we allowed extra time to shower and change! More horsey adventure in the evening. Some in our group preferred this easier mode of horse transportation where we jostled along in a horse drawn wagon and were told stories of Victoria and got to get acquainted with the area as we enjoyed the flowers, the park with peacocks, and old Victorian homes.